A job is a particular project or activity for which you are tracking expenses and billings. This file is used to keep track of all of the valid job numbers being used and their associated budgets. 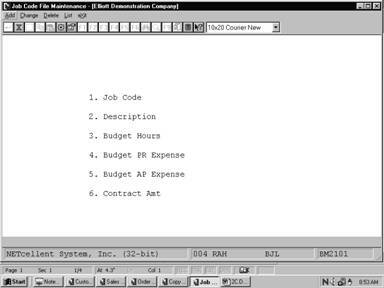 When new BOMP transactions are entered into the system, the production expense amounts can be distributed among any of the jobs that have been entered into the Job Code File. Job Code File Maintenance can only be used if the Use Job Numbers in BOMP Setup is set to Y. Enter the code that you would like to assign to the job being entered. In the change or delete mode, press the F7 key to search for code. Enter a description of the job, which will make it clear to the operator at a glance whether or not he has entered the correct code. 8 numeric digits with 2 decimal place and optional minus sign (999,999.99-). Enter the number of hours that are budgeted for this job. 11 numeric digits with 2 decimal places and optional minus sign (999,999,999.99-). Enter the amount of Payroll expenses that are budgeted for this job. Enter the amount of Accounts Payable expenses that are budgeted for this job. Enter the total contract amount for this job.